This rule applies to the gaming world as well. Be it expensive video games or free to play online browser games, it is increasingly harder to find original, innovative products. Most of them are simply based on cliches. Even when something new comes up to the gaming world, it is most likely to be borrowed from literature or cinematography. Trying to find a truly original game is as pointless like looking for a needle in a haystack. And whose fault is it? Ours, of course! Even though we keep complaining about the lack of creativity in the gaming industry, we buy the products anyway. Moreover, the difference between a copycat version of a successful product, and a new (but not innovative) version of a popular game seems to be not very striking. A vast majority of us prefers to play it safe. When offered a menu we tend to chose dishes that we know. Is it really that bad? We have every right to be afraid of disappointments. And hey, you know what? New does not necessarily mean better. Let us take a look on some of the most wanted and most often copied game themes in history. Think Battlefield 3 and Call of Duty: Modern Warfare 3. The creators of military shooters, once feeding almost exclusively on the pastures of World War II, some years ago moved to more fruitful meadows: the conflicts in Iraq, Afghanistan and the like. A typical scenario includes heroic U.S. soldiers beating up various bad guys: be it rebels wearing turbans, Russian extremists or Chinese invaders. The story is is so simple, not to say primitive, that it might be hard to believe that it has been capturing the minds of players for ten years now. Each year brings at least one release that employs the theme of modern military conflicts. And it sells like hot cakes. ...because it is common knowledge that aliens dream of is to invade us. All the time. Even if by some miracle, the people of Earth happen to encounter a friendly alien race, it will soon be counterbalanced by the emergence of a space enemy who obviously aches for wiping out other inhabitants of the galaxy. And of course our task as players is to save all these human and non-human beings. Zombie games have been recently pursuing an incredibly successful career. Before the “zombie boom”, the living dead made occasional appearances here and there, but only now they get to star in their very own games. Resident Evil was probably the first famous zombie title, but it was not until the release of Left4Dead that the monsters gained wider recognition and an avid fanbase. There are zombie shooter games, zombie RPGs, whole zombie browser games sites, zombie puzzle and platform games. 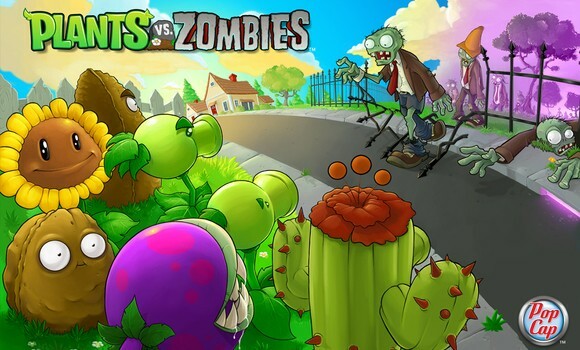 Not to forget the cute and insanely popular Plants vs Zombies skill game. The trend is clearly visible in movies and literature as well (check out Pride and Prejudice and Zombies by Seth Grahame-Smith). The living dead are on top - whether you like it or not.